Annie and the Waves: a children’s book to help prevent drowning! There are just over 800 books now in circulation! Some were donated, some were for promotion and some have been purchased! They are in homes, schools and libraries! They are in Australia and overseas! These books are already helping to prevent drowning and will do every time they are read. Thanks for being part of this amazing journey. Books have arrived and are available for immediate sales! Great Christmas Presents with an important message! Annie and the Waves is now in the printing queue .... she will be rolling through the presses on Monday 20/11/18! 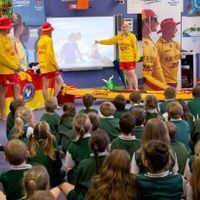 It is really important to educate children and families on how to stay safe at the beach and what to do if they need a surf lifesavers help! People who visit the beach may not have access to surf education or understand the dangers of the sea! Surf safety education is vital to help keep our kids safe at the beach. While it is well known that children learn through listening to or reading story books there are very few children’s books that include vital surf safety imformation. We have written a children's surf safety book! 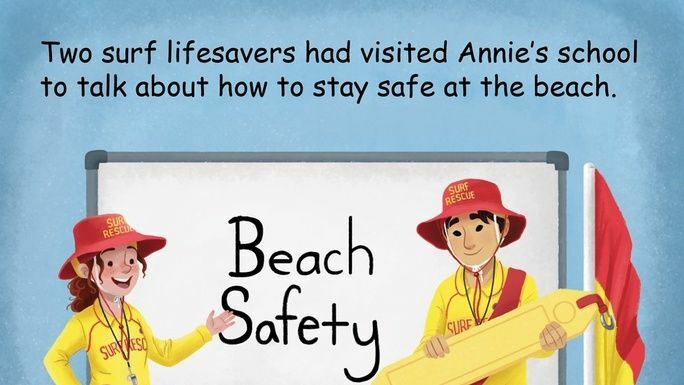 ‘Annie and the Waves’ is an engaging children’s book packed full of colourful illustrations by Carissa Harris that teaches the key safety messages on how to stay safe at the beach. Annie and her family are going to the beach for a holiday. Two surf lifesavers had visited Annie’s school and she had learnt a lot about how to stay safe in the water. Annie soon discovers that the sea is changeable. She is initially wary of the waves but after meeting the lifesavers, and with the help of her Dad, Annie soon discovers the joys of swimming in the sea. Annie’s confidence grows until she experiences a surging wave, a wave that drags her into deep water. Will she remember how to tell the surf life savers she needs help? If you get into trouble, stay calm and raise your hand to show the surf lifesavers you need help. You should never go into the water alone! Annie and the Waves will be dedicated to Chayce ‘a little boy lost to the sea’ Pearl Beach 2014. Annie has been written for children aged 4 - 8 years old but also has great information for adults and families from non english speaking backgrounds. Annie and the Waves is a surf safety initiative supported by Ocean Beach Surf Life Saving Club and endorsed by Surf Life Saving Australia. By purchasing this book you are supporting Surf Life Saving - a community cause which relies on your donations to continue to save lives and keep our beaches and communities safe. Goal - To illustrate, publish and print Annie and the Waves to help educate children and their families on how to stay safe in the surf. Buy a book, donate a book or read Annie and the Waves to a child ..... that’s all it takes to make a difference! 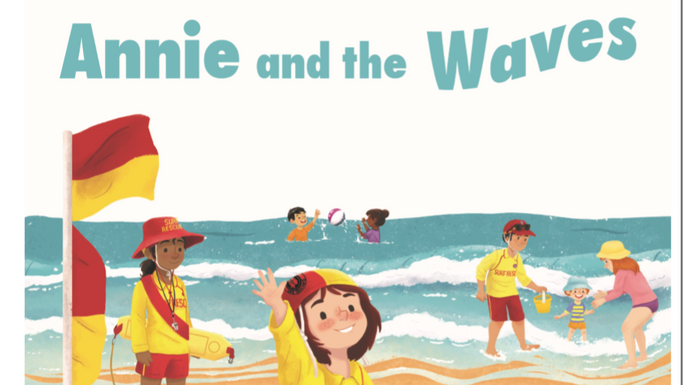 By buying a book you will also be helping to get 'Annie and the Waves' into print! Each book will cost $20.00. This price includes postage (Australia only) and also a small donation that will help with the publishing and printing costs! You can buy a book for your child, grandchild, friend, preschool, school or local library! Annie and the Waves is a children’s book aimed to keep kids surf safe. By buying this book you are helping to prevent drowning. By buying 'Annie and the Waves' you are helping to make a difference! The key surf safety messages in this book could help to save the life of someone you care about. Postage within Australia only. Est. Delivery Date: Date of delivery will be provided on application to the author. * $834 in offline donations included in total. Get in touch with Annie and the Waves: a children’s book to help prevent drowning!